SoftPLC's SSH-x range of operator interfaces (HMI's) are rugged graphic operator interfaces with a high resolution touchscreen display that embed our Web Studio runtime software. Unlike proprietary hardware design HMI's, the SSH-x systems are open architecture (PC based) which gives users flexibility, expandability, and affordability. All units include ethernet, serial, and USB ports and flash or SSD storage. Shallow depth, fanless design, and industrial packaging make these HMI's suitable for a wide range of applications ranging from simple machine controls to complete SCADA systems, in industries such as packaging, utilities, HVAC, discrete manufacturing, batch/continuous processing, and many more. We also offer "Virtual/Remote" HMI's for applications where a PanelPC may not be the best solution - click on the Headless HMIs tab below for details. Don't see what you need? We can create customized systems. Whether you need a different screen size, hardware specification/feature (eg: temperature/NEMA rating, larger disk), or other, please contact us for a quote. 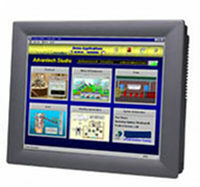 Many SSH-x HMI's are "drop-in" replacements for Allen-Bradley PanelView's. Plus, with our PanelBuilder and FactoryTalk import utilities, you can upgrade an old PanelView application easily and at low cost. Find out more on our A-B HMI Migrations page. Web Clients allow access from a common Web Browser, such as Microsoft Internet Explorer. This is useful when browsing to multiple web sites may be required, such as in a desktop environment. Secure Viewer Clients only allow access through a dedicated browser (included) that allows connection to a Web Studio Server, but the capability to browse to alternative web sites is not allowed. This provides additional security for plant-floor or dedicated supervisory applications. SMA (Studio Mobile Access) Clients allow access to view and optionally change process variables (tags) and monitor/acknowledge alarms from any browser, including PDAs, Firefox/Chrome, and web-enabled mobile phones. A single Client session (of each type) is included with each SSH unit, additional concurrent sessions can be purchased. All SSH-x HMI models include the features below. Detailed specifications by model are on the data sheets linked from the table in the Models tab, or in our web store. For applications where a PanelPC is not the best solution, we offer "Headless" HMI's (also known as Virtual HMI's), where the monitoring/control element is physically separated from the display component. Our Headless HMI's are small VESA or panel-mount embedded PC's that can reside in the control cabinet with the PLC/drives, or attach onto the back of a monitor. The Headless HMI embeds the SoftPLC Web Studio software and can be used with separate display devices or with no display at all. Provide your own display device, or we offer a variety of industrial touchscreen monitors from 7" sizes and up. Applications where the display must meet stringent environmental requirements, such as stainless-steel, wash-down (NEMA4X), hazardous or marine ratings, etc. The table below includes only the most popular standard PanelPC and Headless models. These HMI's and specifications were chosen to meet the needs of most common applications. However, most HMI models can be customized with options such as less/more memory, type/size of disk storage, other operating system(s), etc. We can also provide HMI's with more robust ratings for harsh environments, larger applications, or other specialty needs such as very large displays, tablets, etc. If you need an HMI that offers something other than what is listed, please contact us to discuss your specific application and/or needs. Most Web Studio software features are available on all HMI models. Features that are limited or not available for the Windows Compact Embedded or Embedded Standard operating system are outlined in this document. Common features of all SoftPLC Web Studio HMIs. Specific hardware specifications can be found on each Model's individual data sheet. Software features of SoftPLC Web Studio and Development system. Web Studio features available for each operating system. Some features are limited or not available on embedded O/S.